… Back in my university days, I remember when, one day, flicking through the titles of Italian contemporary literature, I stumbled upon Pierpaolo Pasolini. I knew of him, but I hadn’t read any of his books. You may not like him, you may even hate him, but you can’t deny he was extremely talented. His works are stunning and eclectic. He was a poet, a writer, a journalist, a film director, a play-writer, a philosopher. That day, I picked up one of his books, Ragazzi di Strada, but couldn’t read beyond page 50. Then, it happened again a few years later. A very good friend lent me Amado Mio, one of her favourite Pasolini books. I opened it, read approximately 40 pages but once again I couldn’t continue the reading. With Pasolini I’ve always had a love-hate relationship. For years I rejected him; his books and his films made me uncomfortable. However, if the purpose of art is to move something in your inner inside and make one reflects on the status quo, then Pasolini was a true artist. Then, on a particularly rainy day in London, Theorem was on in a cinema. “So, why not give it a go?” I thought. As for the plot, I must confess I was feeling somewhat daunted. Paolini films are never an easy undertaking. However, when I entered the room, to my surprise, it was completely packed. The film is set in Milan and the surrounding countryside. In Autumn and Winter time it can get so foggy that the landscape seems almost to dissolve. This natural setting perfectly mirrors the characters in the film, who look illusory and frail. Despite all being members of the same family, they are lonely figures, living in their own separate worlds with no emotional bond. The family is comprised of a bored mother, a workaholic businessman father, two spoilt teenagers and a very religious housekeeper. When a mysterious and angelic looking visitor (Terence Stamp) arrives in the house, things start to change. He brings love and care, but soon leaves as suddenly he arrives. And his departure exposes the sad and empty relationships within this bourgeois family. However, the sudden freedom that all the family members have discovered thanks to the love of the stranger causes them all to be struck by various illnesses. When released, in the late 70s, the film caused a scandal – as all Pasolini works did. But, while Pasolini is sometimes difficult to read or watch, this is a great film about human relationships, love, family, bourgeois culture and cultural propaganda. An hymn to Eros, the most powerful and mysterious force of all. And in honor of Teorema, today’s recipe is nettle risotto, a classic of the Italian rural tradition- – you’ll understand why when you watch the film! two big handfuls of young nettle leaves; 2.5 litres vegetable stock; 50g butter; one onion, very finely chopped; 400g Vialone Nano rice; 125ml dry white wine; salt and pepper; 75g cold butter, cut into cubes; 100g Parmesan, grated. Blanch the nettles in salted boiling water for 30 seconds, drain and put into a food processor. Pulse to a purée, adding a little water if needed to keep it on the loose side. Bring the stock to a boil, then reduce to a simmer. Melt 50g of butter in a heavy-based pan, add the onion, and cook gently until translucent. Add the rice and stir both to coat it in the butter and to “toast” the grains. Make sure all the rice is warm, then add the wine. Let the wine evaporate until the onion and rice are nearly dry, then add stock, a ladleful at a time, stirring constantly, each time waiting for the liquid to evaporate before adding the next ladle. 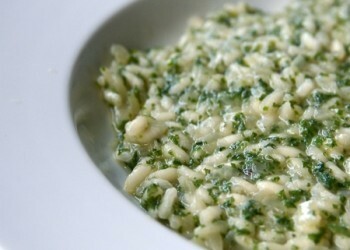 After about 10 minutes, add the nettle purée, and carry on cooking, adding stock as you go, until the rice is soft but still al dente (with bite) – the risotto shouldn’t be too “soupy” otherwise, when you add the butter and Parmesan, it will end up too sloppy. Turn down the heat, allow it to rest for a couple of minutes, then, using a wooden spoon, beat in the cold cubed butter and Parmesan. Season and serve. · Recipe by Giorgio Locatelli, of Locanda Locatelli.